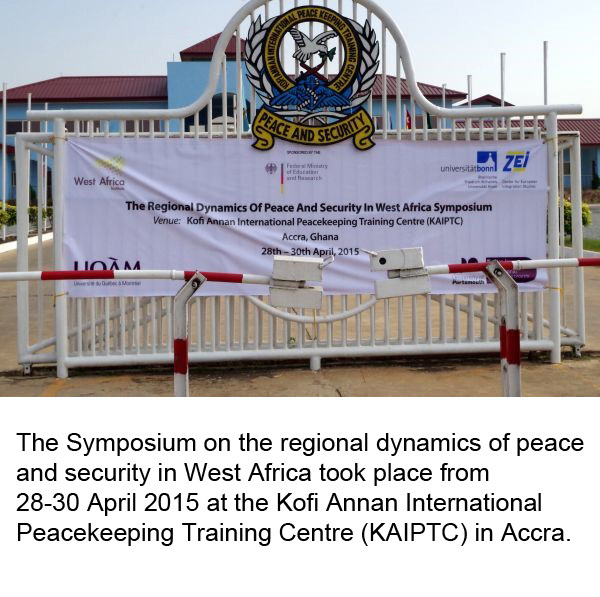 In April 2015, the WAPSN organized a symposium on the Regional Dynamics of Peace and Security in West Africa at the Kofi Annan International Peacekeeping Centre in Accra. The event brought together researchers and practitioners from Africa, Europe and North America to discuss current challenges to peace and security in West Africa. Among others, the Vice President of the ECOWAS Commission, H.E. Dr. Toga Gayewea McIntosh, the Political Director of the ECOWAS Commission and UN representatives were in attendance. Debate focused on the crisis in Mali, the MINUSMA operation, maritime security in the Gulf of Guinea, the role of France in West Africa and on the coordination of different organizations in conflict resolution. Drawing academic and practitioners together from a broad spectrum of field of expertise, the symposium was regarded by delegates as a founding stone for the development and growth of the WAPS Network. The Political Director of the UN-Office at the African Union, Dr. Abdel-Fatau Musah notably stressed that exchange between academics and practitioners could foster solutions : “The prevention of conflicts requires their deeper understanding. Therefore, a better communication and cooperation between practitioners from regional and international institutions, civil servants from national governments and researchers is needed to strengthen this understanding and use it in an effective way”. The West Africa Peace and Security Network’s annual workshop “New Thinking on West African Security Challenges” was held at the University of Portsmouth on the 17th-18th of May 2018. The workshop discussed new approaches on security challenges in West Africa including highly relevant topics such as the role of foreign powers for West African peace and security; the AU and ECOWAS’ approaches to address peace and security on the continent; non-state actors, violent extremism, security and knowledge production in West Africa. Participants included academics and experts from West Africa, the UK and Europe. For more details, please see the workshop programme. The West Africa Peace and Security Network (WAPSN) organised its fourth annual symposium in Bamako, Mali on 4-5 May 2018 at the Ecole de Maintien de la Paix (The Peacekeeping School). This event aimed to create the space, time and opportunity for the free exchanges of ideas, scientific cooperation and practical interaction between policy and academic worlds. Each year highly topical issues are chosen to foster this exchange of ideas and provide a series of policy-relevant insights on peace and security in West Africa. Participants included academics and experts, mostly from West Africa, the UK, continental Europe and Canada. Participants also included practitioners from a variety of organisations such as: civil society organisations (e.g. the West African Network for Peacebuilding (WANEP), diplomatic services, armed forces and regional and international organisations (e.g. ECOWAS, the UN, the EU), and research and training institutes (e.g. the Legon Centre for International Affairs and Diplomacy (LECIAD) and the Institute for Peace and Strategic Studies (IPSS), University of Ibadan, Nigeria. For more details, please see the symposium programme.